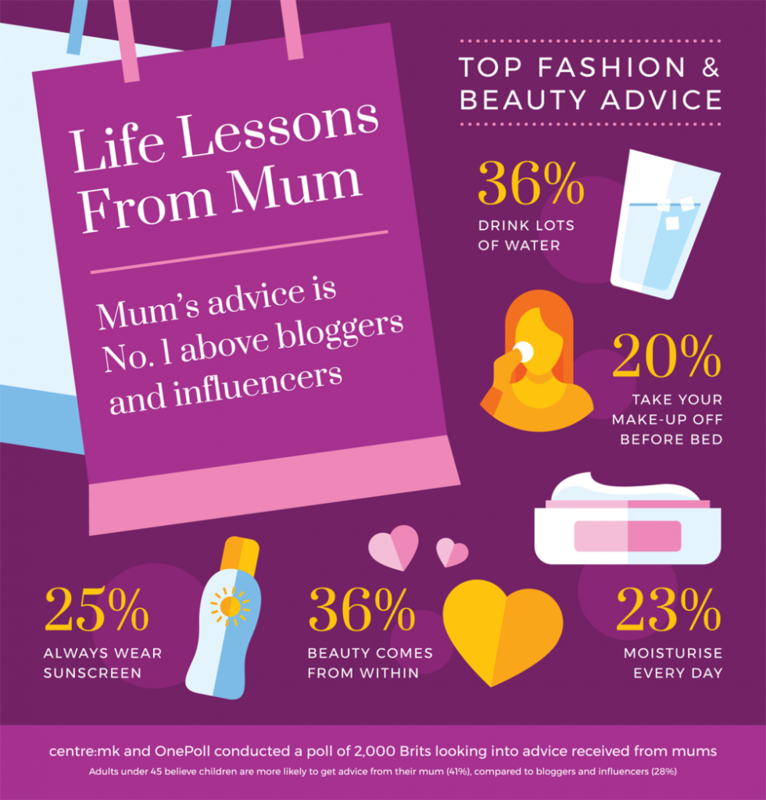 Brits are shunning the internet and turning to mum for life lessons and advice on beauty, fashion and relationships, according to a new survey carried out ahead of Mother’s Day a week on Sunday (March 31st, 2019). Researchers who carried out a detailed study found our mums are still the number one influencer despite the proliferation of sources available on the internet. Carried out by centre:mk, one of the UK’s top 10 shopping centres, the poll marks the launch of its ‘Life Lessons From Mum’ campaign www.centremk.com ahead of Mother’s Day. The most common life lessons are ‘believe in yourself’, ‘there is no such word as can’t’ and ‘treat others as you would like to be treated’. Beauty tips such as ‘moisturise daily’ and ‘always take your make-up off before bed’ also made the list. The study also found six in ten adults pass their mother’s advice onto their own children. Kim Priest of centre:mk said: “It’s fantastic to see that mums are holding strong as our No.1 influencer. Centre:mk is an official patron of the British Fashion Council, in recognition of its mix of cutting-edge fashion and beauty brands and its commitment to investing in driving and supporting the UK’s pioneering fashion and beauty industries.